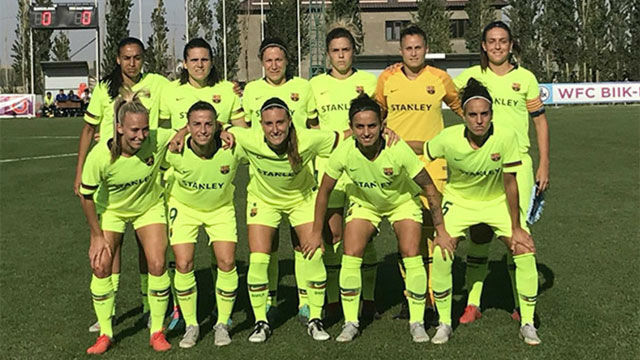 What was supposed to be a straight forward afternoon in Kazakhstan became a nightmate for Barcelona's women's team on Wednesday. Zheleznyak, Rosenquist, Gabelia (Krasyukova, 80'), Kulmagambetova (Beard, 67'), Litvinenko, Mashkova, Myasnikova (Ikwaput, 49'), Ihezuo, Adule, Kravets y Korte. 1-0 M.45+6: Alexia (pp). 2-0 M.49: Ikwaput. 3-0 M.60: Gabelia. 3-1 M.66: Toni Duggan. Fran Sanchez's side were stunning the first leg of their Champions League tie against the modest BIIK Kazygurt, losing 3-1. Perhaps the only positive is that Toni Duggan's goal came when they were already three goals behind and could prove to be a vital away goal when the two teams meet at the Mini Estadi on Sept. 26. Barça didn't start badly in Kazakhstan. They were in control but couldn't find the breakthrough, with home goalkeeper Zheleznyak making three decent saves -- two from Barbara Latorre and one from Duggan. However, the Catalans found themselves behind in the sixth minute of first half stoppage time (due to an injury to Myasnikova, who left in an ambulance) when Gabelia's corner found it's way into the back of the net via a touch from Alexia. The second half quickly turned into a shipwreck, with goals from Ikwaput (48’) and Gabelia (60’) giving the hosts a stunning three-goal advantage. Six minutes later, Duggan pulled one back, but Barça couldn't find another goal despite pressing and have it all to do in the second leg later this month. It would be unforgiveable if Barça failed to turn it around, considering Lieke Martens, Vicky Losada, Marta Torrejón and Mariona were all rested for the first leg.